A recent article from the Connecticut Post looked at the budget priorities for outgoing Governor Dannel Malloy, including teacher pensions. Connecticut's teacher pension system is in particularly bad shape, and the article notes that, "according to one study, [Connecticut's] annual contribution could more than quintuple, topping $6.2 billion by 2032." The current system of funding teacher pensions also is regressive. To make his point, Malloy contrasted one of the state’s most affluent communities, Greenwich, with one of its poorest, New Britain. Both have similar populations and school enrollment totals, but Connecticut spent $24 million more last year to cover pension costs for retired Greenwich teachers than for those from New Britain. In simple terms, Greenwich can afford to pay much higher salaries than New Britain can, yet it gets more help from the state on a per capita basis to provide pensions for its retired teachers. There are a handful of states, like Illinois, Kentucky, and New Jersey, that also pay for teacher pension costs out of the state's general fund. These states tend to be in worse financial shape, since state legislators face annual decisions over whether they should contribute to the pension fund or use the money elsewhere. And inevitably, politicians find other places to spend money, and they regularly short the pension fund. 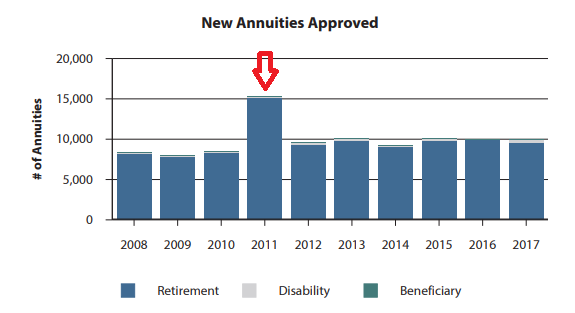 That has implications for the financial health of the plan, but Connecticut is a good reminder that paying for pension plans this way also leads to large and inequitable subsidies. The biggest winners from this arrangement are communities with a stable teaching workforce, like Greenwich, that can afford to pay high salaries. A "blue" state like Connecticut is operating a pension system that is neither fair nor progressive. Connecticut provides a stark example of funding inequities buried in statewide pension plans, but every state has benefit inequities even when districts are responsible for paying the tab. That's because most states are operating statewide teacher pension plans, and they set contribution rates as a function of all teachers in the state. In that arrangement, school districts with high teacher turnover and low salaries will be forced to subsidize the pensions earned in districts with higher teacher stability and higher salaries. The politics of this are especially confusing, because the loudest defenders of pension plans are Democrats who support efforts to increase equity in other areas of policy. But on pensions, Democrats are often the ones fighting to preserve systems that deepen financial inequities. 1: With the loss of agency fees, teachers unions will have fewer paying members and thus smaller budgets. 2: With smaller budgets, teachers unions will be less effective at lobbying for change on behalf of their members, and teachers will have lower salaries and worse working conditions. 3: Lower pay will harm the teacher workforce, through worse recruitment and higher turnover rates. But what if these issues are not as directly related as theory might predict? My thinking on this question was challenged by an academic paper that came out a few months before the Janus case was decided. In that paper, political scientist Agustina Paglayan looked at the timing of when states adopted collective bargaining and how that related to changes in teacher salaries and overall education spending (see an Education Week write-up here, or read the full study here). Paglayan found that states with high education spending and high teacher salaries were more likely to become unionized. In fact, the notion that teachers unions caused teacher salaries to rise appeared to be backwards: Places that were already investing in public education and paying their teachers well were also likely to allow those teachers to unionize. Paglayan's paper included state-by-state graphs showing that unionization often followed large increases in school spending and teacher salaries, not the other way around. If we apply the lessons from Paglayan's research, the Janus case may well weaken unions, but we should decouple that effect from predictions about changes in education spending or teacher salaries. The connection between teachers unions and the teacher workforce may not be as tight as the conventional wisdom might predict. The recent history in Wisconsin presents a useful modern comparison. In 2011, Wisconsin Governor Scott Walker signed a controversial piece of legislation known as Act 10. The bill restricted collective bargaining to base wages, required annual recertification for bargaining unit representation, and raised teacher contribution rates to the state pension and health care systems. Many observors predicted these changes would devastate the teacher workforce in Wisconsin. We already have some preliminary results, and Wisconsin teacher union membership and union revenues did indeed go down. There's also been some preliminary research suggesting that more Wisconsin school districts are experimenting with differential pay, which may create a more uneven spread between winners and losers. But the more drastic predictions about the demise of the Wisconsin teacher workforce have not transpired. Today, there are more educators working in Wisconsin schools (over a time when student enrollment actually dipped slightly), and average salaries have kept up with other states (although not inflation, see more below). After an initial surge of retirements when the law passed in 2011, things have returned to normal. Meanwhile, turnover rates, salary growth rates, median years of experience, age, and retirement rates all look pretty much in line with long-term trends. And regardless of who wins the governorship tomorrow, school spending is likely to rise in the immediate future: Both Walker and his Democratic opponent, state schools superintendent Tony Evers, have proposed significantly more education spending. Leading up to 2011, Wisconsin was shedding public-sector jobs, especially in education. After Act 10 passed in 2011, Wisconsin was slow to rebuild its teacher workforce, but it has happened over time. Today, Wisconsin is back to about where it was in 2010. Meanwhile, K-12 student enrollment has fallen by about 0.5 percent over this same time period. As we've written before, Act 10 did seem to lead to a large exodus of workers right when it passed. This surge may have led people to believe this was a new normal, but in subsequent years the number of workers retiring each year has returned back in line with its prior baseline. Contrary to what we might expect, this mass exodus of veteran teachers did not seem to harm student achievement. This is consistent with evidence from the retirement world, where early retirement programs that induce many veteran teachers to retire have not led to declines in student performance. In fact, the teacher workforce in Wisconsin today looks pretty similar to what it looked like in the past. Since Act 10 passed in 2011, the average age of Wisconsin teachers has dropped from 43.5 to 43.3 years old. It hasn't budged at all since 2013. Similarly, the average years of experience has also not changed much, and it's risen from 12.4 in 2011 to 12.6 years of experience today. Average salaries show a similar trend. The graph below is in nominal dollars, so it presents a slightly rosier picture than what Wisconsin teachers might be feeling. In inflation-adjusted terms, Wisconsin teacher salaries are lower today than they were in previous decades. But you could have said the same thing at the end of 2010, before Act 10 passed. In real terms, average teacher salaries in Wisconsin were much higher in the late 1980s. Act 10 had nothing to do with this long-term decline. The slide in average teacher salaries is also not unique to Wisconsin. In real terms, teacher salaries have been flat or declining all across the country, and the changes in Wisconsin in recent years put it in the middle of the pack on this metric. Wisconsin teachers also retire at younger ages than their public-sector peers (and much earlier than the typical worker in the private sector). 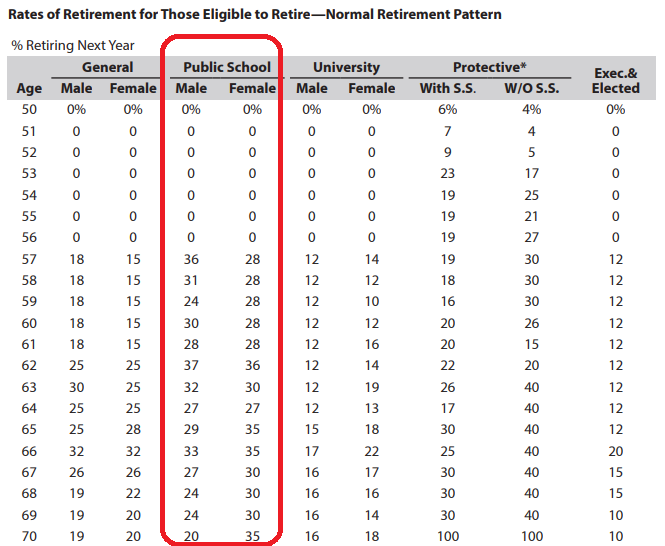 According to this chart, the WRS assumes that 36 percent of male public school employees will retire when eligible at age 57, compared to 18 percent of similar general state employees. 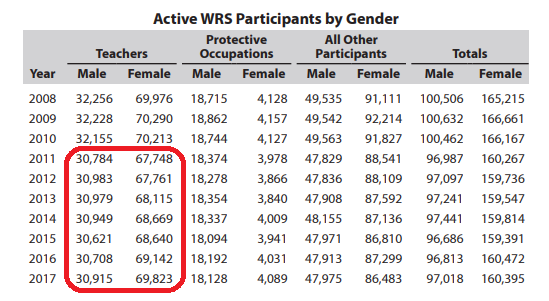 On a cumulative basis, that means very few Wisconsin teachers remain in the classoom into their 60s, and they have different retirement patterns than general state employees or university employees, despite them all being enrolled in the same retirement plan. Overall, Act 10 had a large effect on Wisconsin teachers unions but hardly any effect on Wisconsin teachers. That distinction is important, and as we look to interpret the effects of the Janus decision, the Wisconsin example should remind us to be careful to separate out the effects on unions from the effects on teachers. Do All Teachers Get Pensions? Unlike teachers in private schools, the Bureau of Labor Statistics reports that 89 percent of “primary, secondary, and special education school teachers” employed by state or local governments participate in a defined benefit (DB) pension plan. That figure is down slightly from 2009, when 94 percent of public school teachers participated in DB plans. Those numbers are changing over time as more states transition to alternative retirement plans such as defined contribution or cash balance plans. Some states give new teachers a choice over which type of retirement plan they prefer, but the new plans usually only apply to new workers, so participation rates will fall slowly as more states transition away from the old DB pension model. States impose rules called vesting requirements that determine how long a teacher must stay before she qualifies for a pension. The majority of states require teachers to serve for five years before qualyfing for a pension, and 16 states require teachers to serve for 10 years. Due to relatively high early-career turnover, large numbers of teachers won't reach these vesting requirements. In the median state, about half of all new teachers won't stay long enough to qualify for any pension at all. (See the numbers for your state here.) Whether they decide to switch jobs, move to another state, or leave the workforce entirely, many teachers are technically enrolled in a pension plan, but they may never actually receive a pension. Merely qualifying for a pension does not say much about how large that pension will be, and many teachers decide they'd rather withdraw their contributions than wait to draw a pension when they reach retirement age. For example, a 40-year-old teacher with 10 years of experience would likely qualify for a pension, but she may not be able to collect those payments until she turns 60 or 65. Her pension at that point will be based on the salary she earned while she was 40, and inflation will have worn away its value significantly. (For a longer explanation of how this works, see here.) This issue isn't as true for older teachers who are closer to retirement, but they may still decide they'd prefer a lump-sum withdrawal payment over monthly pension checks in retirement. These are complicated decisions, and teachers should consult a financial professional to help determine what's best in their unique circumstances. About 40 percent of public school teachers, or about 1.2 million teachers nationwide, are not covered by Social Security. Those teachers are concentrated in 15 states— Alaska, California, Colorado, Connecticut, Georgia, Illinois, Kentucky, Louisiana, Maine, Massachusetts, Missouri, Nevada, Ohio, Rhode Island, and Texas—and the District of Columbia, where many or all public school teachers neither pay into nor receive benefits from Social Security. Teachers in those states face substantial uncertainty and must rely more heavily on their employer retirement plans (state pensions) and personal savings. While there's a debate about whether teacher pension plans are too generous, that debate is skewed by who ends up receiving benefits. For example, going back to our earlier example, for a teacher who quits working at age 40 with 10 years of service, her pension is likely to be quite modest by the time she's eligible to collect her benefit. In contrast, some long-serving, highly-paid employees wind up with pensions that surpass $100,000 a year or more. There are many more people like the former than the latter, but calculating the statistical average combines them all into one number. Teacher pension plans today are very expensive, but the bulk of those costs are going to pay down unfunded liabilities, not for actual benefits for teachers. Once we take out the debt costs that states and districts are paying, the total retirement savings provided to teachers start to look worse. Moreover, pension plans distribute benefits in an uneven fashion. Some lifelong veteran teachers and school district administrators qualify for pensions that are quite generous, while the bulk of teachers will receive far less. Teachers may take comfort with the fact they're enrolled in a pension plan, but they should check the fine print and consult a financial advisor to determine how long they need to stay in their respective pension plan in order to secure a solid foundation of retirement benefits. There’s a common misconception that teachers’ retirement plans are gold-plated, extremely generous options. And for a very small pool, they do provide a secure retirement. But that’s not the case for the majority of teachers. To illustrate this, we dug into a sampling of states to see how they measure up, and ran the numbers to see if an alternative plan design might serve more of their workforce. Here’s what we found for Georgia. Georgia’s current defined benefit plan is more extreme than most. The formula used by the Teachers Retirement System of Georgia (TRSGA) offers minimal benefits to short- and medium-term workers and requires an especially lengthy vesting period – ten years. If Georgia teachers stay nine years or less, they do not qualify for any pension or employer-provided retirement benefit at all. In addition, not all Georgia teachers are covered by Social Security. It’s up to each district to decide whether to extend coverage to educators, and teachers in metro Atlanta, DeKalb, Fulton, and Clayton counties, who do not have Social Security coverage, are particularly vulnerable to a poorly designed state retirement system. Most Georgia teachers won’t actually benefit from their retirement benefits. In Georgia, 83 percent of teachers who begin their careers at age 25 will leave before reaching 30 years of service, which is the point when they’ll finally qualify for a benefit that’s more than their own contributions plus interest. The graph below compares pension wealth accrual to Georgia teacher retention rates, and captures this discrepancy. Given its current workforce demographics, most Georgia teachers would do better under a more portable retirement plan. A portable plan would better support Georgia’s mobile teacher workforce and allow educators to take their savings with them across state lines or out of the classroom. In addition, nearly all portable plan options would accrue benefits in a smoother fashion, rather than the state’s current back-loaded model. 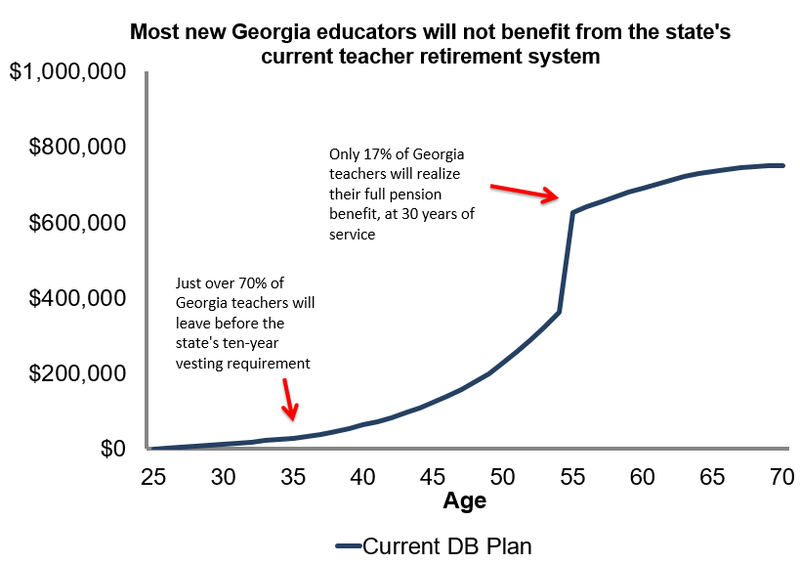 We know most Georgia teachers will leave before they reach peak pension wealth – they shouldn’t suffer from inadequate retirement savings because of it. All Georgia teachers should have access to a portable, fair retirement plan, as well as Social Security coverage. The current system works for some, but not most of Georgia’s educators. A portable solution could better serve the state’s existing workforce. Teacher pension funds are complicated and can be difficult to understand. They’re not as straightforward as other retirement savings accounts, such as 401ks, nor are they like traditional investments in stocks. In a 401k, for example, the value of the retirement fund is determined by employer and employee contributions, plus the growth of those investments over time. Defined benefit pension plans, like the ones serving 90 percent of public school teachers, don't work that way. To be sure, teacher pension plans are invested in the market. However, individual teacher contributions and those made on their behalf by the state or school district do not determine the value of the pension. Instead, a teacher's pension wealth is determined by a formula based on her years of experience and final salary. To further complicate matters, there often are several tiers within a state’s pension fund that provide different levels of benefits based on when a teacher was first hired. And of course, teacher pension funds can vary significantly from state to state. In Arizona, teachers are a part of the Arizona State Retirement System, which includes not only teachers but all state employees. Indeed, the system was established in 1953 and teachers voted to join two years later. The basic structure of Arizona’s teacher pension is similar to that of other states. The figure below illustrates how a teacher pension is calculated in Arizona. It is important to note, however, that the state assesses an educator’s final salary based on their average salary from the past 5 consecutive years. Generally, states use a consistent multiplier, for example 2 percent, for all teachers. However, Arizona is unique and applies four different multipliers depending on the teacher's years of service. This approach provides slightly more generous benefits to those teachers who serve the longest. As shown in the table below, for the first 19 years a teacher’s pension benefit will be calculated with a multiplier of 2.1 percent. Once they begin their 20th year teaching, however, the multiplier increases to 2.15 percent. There are a few other features of Arizona’s teacher pension plan that make it unique. First, unlike most states, Arizona does not have a vesting period. This means that educators qualify for a pension regardless of how long they serve. That pension may not be worth all that much, and educators can’t begin to collect it until they hit the state’s retirement ages, but immediate vesting does at least ensure all educators begin to accrue pension benefits immediately. Age 55 with at least 30 years of experience. Additionally, Arizona allows early retirement at age 50 with at least 5 years of experience, but teachers taking that option have their benefits reduced based on their years of experience and how early they are retiring. As they work, teachers and their employers must contribute into the plan. Those contribution rates are set by the state legislature and can change year-to-year. In 2017, both the state and the employee contributed 11.34 percent of their salary to the pension fund. This year the rates are the same, but that may not always be the case. Finally, in Arizona, as with most states, teacher pensions are not portable. This means that if a teacher leaves the state she can’t take her benefits with her, even if she continues working in the teaching profession. As a result, a teacher who moves states might have two pensions, but the sum of those two pensions is likely to be worth less than if she remained in one system for her entire career. In other words, the lack of benefit portability will hurt the long-term retirement savings of any educator who leaves teaching altogether or who crosses state lines to work in another state. An unfortunate feature of teacher pension systems is that they are severely back-loaded. In other words, benefits accrue extremely slowly and thus educators only earn valuable pensions after decades of service. This structure may work well for teachers who spend their entire career in classrooms in a single state, but it does not work as well for those educators who change jobs or are more mobile. 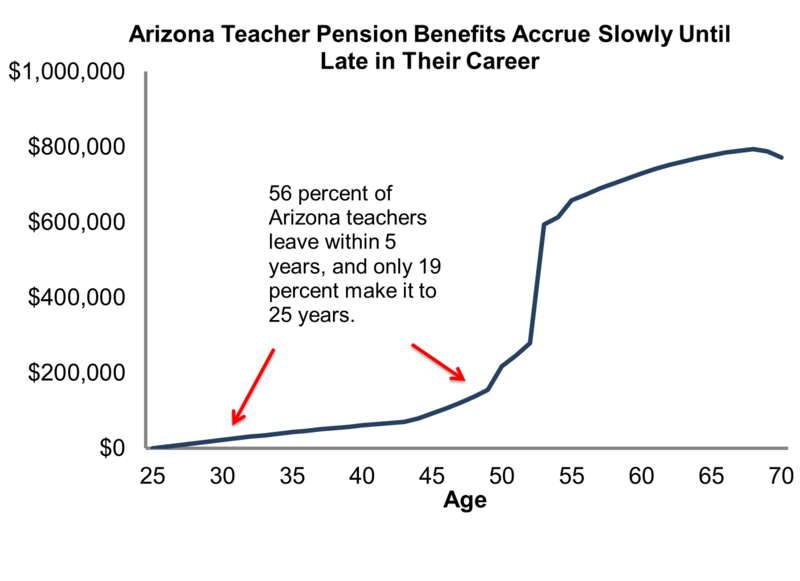 The graph below illustrates the benefit accrual rate for a typical Arizona teacher who begins teaching at age 25. The first thing to notice is that benefits accrue very slowly until they teach for about 25 years. However, According to the state’s own projections, only about 19 percent of teachers will remain in the profession long enough to reach their 25th year of service. In other words, for most teachers Arizona’s immediate vesting does not translate into a valuable pension benefit. There is a severe mismatch between Arizona’s teacher pension system and the educator workforce in the state. Pensions are great at providing valuable retirement benefits to those who spend their entire career in schools in one state. But the Arizona teacher workforce doesn’t fit that model. As a result, the vast majority of teachers in Arizona will leave their years of service with only meager retirement benefits. Overall, Arizona’s teacher pension system is a bit more complicated than the typical state plan. But as with most state pension funds, Arizona’s teachers must remain in the profession for nearly three decades to earn a quality retirement benefit. With that in mind, new and current teachers in Arizona should think carefully about their career plans and how they interact with the state's retirement plan. 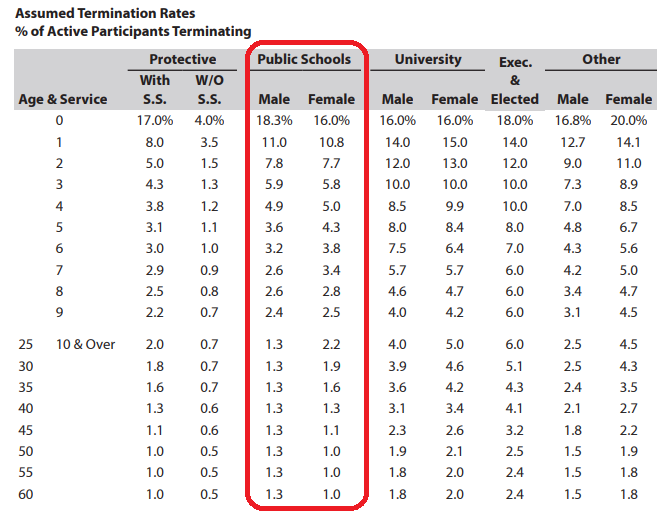 Educators who leave the profession early, even if they qualify for a small pension, will unintentionally do damage do their long-term retirement savings. How Much Does Teacher Health Insurance Cost? Fact #1: Teachers are much more likely to receive health care benefits than employees in other fields. This is a big discrepancy. Two-thirds of all employees in the private sector have access to medical care benefits through their employer, whereas 99 percent of public school teachers do. Teachers are also far more likely to receive retiree health benefits than their peers in the private sector. Teachers are also more likely to have access to other health care benefits. Compared to their private-sector peers, teachers are more likely to have access to dental care (58 versus 42 percent), vision care (36 versus 23 percent), and prescription drug coverage (97 versus 66 percent). Fact #2: Among those receiving benefits, teacher health care costs are slightly higher. In terms of medical care premiums, teacher plans are slightly more expensive, and teachers bear a slightly lower share of their costs than private-sector workers do, but the gaps are not as large as you might expect. Compared to private-sector workers, a higher share of teachers get their full medical premiums paid for (24 versus 15 percent). For single coverage, teachers receive a medical care subsidy from their employers worth about $6,168 per year, or about $961 more than what private-sector workers receive, 18 percent higher. Teachers themselves chip in an average of $1,175 toward annual premiums, compared to $1,384 for private-sector employees. For familiy plans, teachers contribute $257 more than non-teachers, school districts contribute about $600 less than private employers, and the total cost of the plans are nearly identical (and actually a couple hundred dollars higher for private-sector workers). Fact #3: Teachers receive medical coverage for a full calendar year, even though they may only work for 10 months. About 18 percent of teachers earn income from a second or third job to cover their mortgages or other household expenses, but when they seek outside employment, at least they don't need to worry about health care coverage. That is a protection not all workers have. Adding up all these factors, the average teacher receives health benefits that are much better than employees in other sectors. But those differences are mainly driven by universal coverage, not the generosity of the underlying benefits. *Throughout this post, I rely on data from the National Compensation Survey from the Bureau of Labor Statistics. For a more detailed overview, read this Education Next piece by Robert Costrell and Jeffrey Dean.